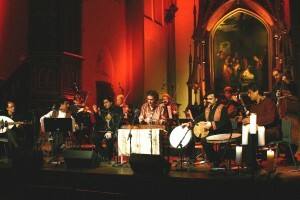 The International Orchestra Rumi Ensemble and Salar Aghili will be on the European Tour since 17 th of February 2012, performing concerts in countries like Belgium, Netherlands, Germany, Spain, Sweden and Norway. In 2007 the World celebrated the 800th Birth Anniversary of the great Sufi poet Rumi. Hundreds of years after his death, the poetry of Rumi still speaks to the hearts of people like never before and his poems are read all over the world. 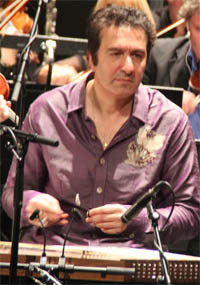 In the same year, the international Orchestra “Rumi Ensemble” was founded by Javid Afsari Rad, an ingenious Iranian composer and innovative interpreter of Santur, with uniting 11 artists from different nations in a novel cross-cultural exchange. Javid Afsari Rad brings Rumi´s thoughts and words into the music among the foremost artists from different cultures and continents. 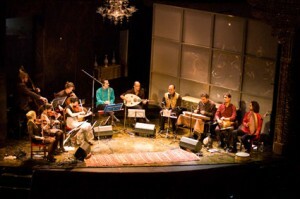 Musicians from Iran, India, Norway, Germany, Sweden and the United States come together in one stage to provide a peaceful musical conversation. With the artful blend of sounds of Santur, Ney, Lute, Tonbak, Daf, Violin, Viola, Cello, Bass and Persian traditional songs, “Rumi Ensemble” takes audiences to hidden depths. It has connotations of both the Sufi tradition and the western classical music in its alternation between the tranquil and meditative as well as the seductive and ecstatic moods. The program starts with the sound of secret flute “Ney” that Rumi describes in his master piece “Masnavi”, as the narrator of life and creation.Then follows by the Persian percussion “Daf”, the instrument which is mainly used in Sufi rituals, taking the audience to a journey of the mystical world of music and poetry. The music flows forth into an energetic climax of rhythms inviting audiences to experience a brilliant transcendent state. Throughout the performance, the verses of the great Persian mystical poet Rumi, speaking of love and tolerance, are chanted by a powerful and lucid voice of the singer to the tune of the fascinating musical fusion. 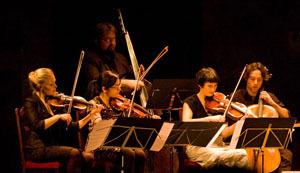 Since its foundation in 2007, Rumi Ensemble has appeared on stage of the prestigious concert halls and Theatres of different countries in Europe, where well-received by both public and media. Among others, the magnificent Jacob Church (Oslo, Norway) in 2007, the splendid Church Nuestra Señora de las Delicias (Madrid, Spain) in 2008, the emblematic “Bâtiment des Forces Motrice” Hall (Geneva, Switzerland) in 2009 , the glorious Theatre Infanta Isabel (Madrid, Spain) in 2010. 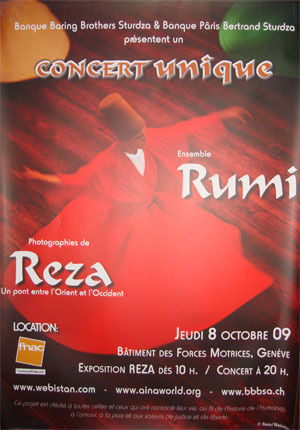 One of the most memorable performances of the group was accompanied with the photo exposition and projection of the acclaimed photographer, Reza Deghati, as an intercultural event in the emblematic “Bâtiment des Forces Motrice” Hall (Geneva, Switzerland), in October 2009.